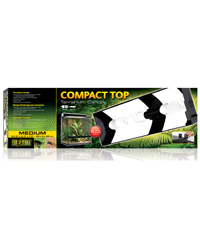 The 60cm Exo Terra Compact Top fits all Exo Terra Glass Terrariums that are 60cm wide. It fits directly onto the mesh lid and will take three screw fitting compact lamps or incandescent bulbs. The top arrives ready wired all you need is the bulbs(not supplied). One of the bulbs is independently switched on this canopy meaning you can utilise day and night bulbs.